DHAKA (Reuters) -Bangladesh security forces have arrested 12 suspected militants, including the chief of the al Qaeda in Indian Subcontinent (AQIS), which claimed responsibility for two killings this year of bloggers critical of religious extremism. 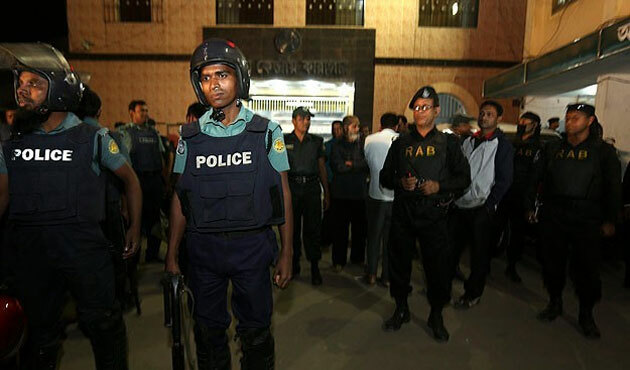 The 12 were arrested in overnight raids in different parts of Dhaka, said Maksudul Alam, a deputy director of the anti-terrorism Rapid Action Battalion. Mainul Islam, the AQIS chief coordinator in Bangladesh, and his top adviser, Zafar Amin, were among the 12. “Explosives, bomb-making materials, sharp weapons and training manuals were recovered from them,” Alam said. AQIS is an Al Qaeda affiliate for militant activities in South Asia. Three online critics of religious extremism in the Muslim-majority nation have been hacked to death this year by machete-wielding attackers in Bangladesh. AQIS has claimed responsibility for two of the killings, including that of U.S.-Bangladeshi activist and blogger Avijit Roy. In May, Bangladesh also arrested three suspected members of Islamic State, including an IT manager at a subsidiary of Coca-Cola Co in Dhaka, amid growing fears that the militant group could be extending its influence in South Asia.